The Chamber of Pop Culture proudly presents a collection of personal and collaborative work by Alex Simpson and Daniel Clark, titled MURMURS  combining new experiments in painting, drawing and sculpture against a soundtrack of eerie and uplifting improvisations interspersed with fragments of Clark's tape recordings. A rite of passage into childhood misadventure, trampled gardens, tiny shoe burials, monsters and frogs from the eyes, as told through ink-bled figures, intricate lines, spectral stains, and polyfiller effigies. Alex Simpson is a multi disciplinary artist who works intuitively across painting, sculpture, printmaking and animation. 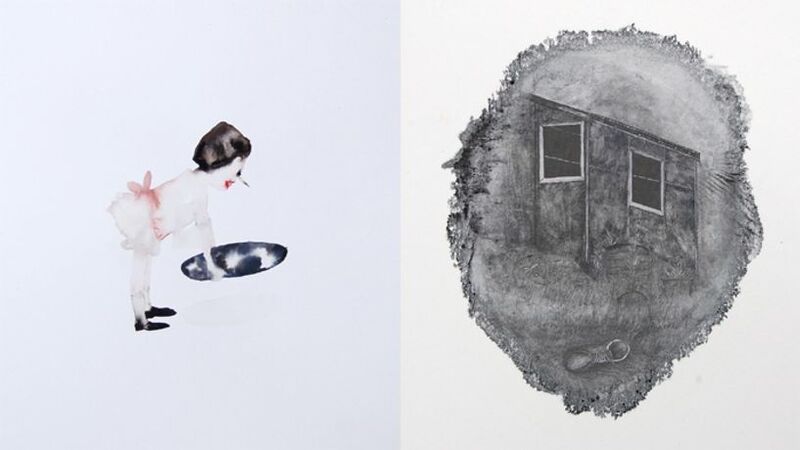 Her work centers around personal narratives that are played out in worlds of melancholic children and strange creatures exploring their relationships with loss, fear and the unknown. At the core of Simpson's practice is painting  a dialogue between artist and medium  in which she invites spontaneity to bleed out her delicate figures into washes of ink. More recently Simpson has begun to work with ceramics  sculpting three dimensional counterparts to her gouache apparitions  rigorous experiments with glazes has helped her retain the textural flow of painting in this new medium. Simpson's goal is to create a coherent visual language across these mediums  her new visual / sound collaborations with Daniel Clark for their âMURMURS' exhibition further cements this. Daniel Clark is an illustrator interested in experimental image making and sound. His work is motivated by the use of field recordings  muffled conversations heard through floorboards  surreal dialogues with uncertain voices  these abstract narratives he investigates further through painting, drawing and music The use of found materials is especially prevalent in his visual work  deteriorated textures, spectral stains and blooms of water damaged paper  out of which landscapes and people start to emerge  accompanied by warped tape music that plays out in fluctuating tempos.